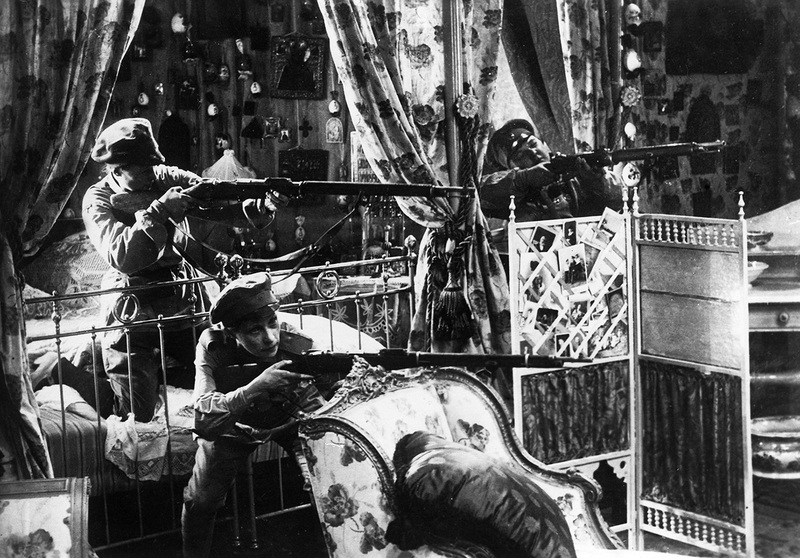 Soviet films Scene from the movie 'October: Ten Days That Shook the World'. From Eisenstein to Oscar-winning Mikhalkov, sit back and enjoy the revolt. The events of 1917 in Russia, the subsequent Civil War, and the establishment of the new Soviet government continue to inspire the artistic world, from painters and writers to architects and composers. Film directors are no exception. RBTH remembers six films that could help you better understand and interpret the history of the revolutionary era. This film is the final part of director Sergei Eisenstein's trilogy. He admitted that the revolution had "given him the most precious of all things: It made him an artist." The revolutionary triptych began with his debut, Strike, and continued with Battleship Potemkin about a sailors' rebellion in 1905. October is the cinegrapic quintessence of the revolution, from the toppling of the Emperor Nicholas II monument to Lenin's speech declaring the victory of the revolution. The most important and most famous scene in the film is when the sailors storm the Winter Palace. It’s included in almost all documentary films about the 1917 events. This is an adventure film by the Vasiliev brothers about self-sacrificing Red Army commander Vasily Chapaev, who with his friends Petka and Anka fought the White Guard. The film is an illustration of the Russian Civil War and bygone heroes. The heroic tale of Chapaev was a sensation adored by viewers and critics, and received a prize at the first Moscow Film Festival. It was also highly esteemed by Stalin. The film is still loved today. In fact, Russian President Vladimir Putin says it’s his favorite Russian film. Shot 20 years after the revolution, Mikhail Romm's film concentrates on the personality of Vladimir Lenin – a funny neurotic before turning out to be the genius of the revolution. In the opinion of his contemporaries, actor Boris Schukin played the revolution's leader so virtuously that viewers stood up and applauded when he appeared on screen – it was as if they were standing in front of Lenin himself. The film came out in the U.S. and Europe and foreign reviewers generally praised the movie, and remarked that Schukin's Lenin is "interesting, vivid, and likeable for the viewer." This two-part film based on the works of Mikhail Bulgakov (primarily his play Flight and the novel The White Guard) has an outstanding cast headed by Lyudmila Savelyeva (Natasha Rostova in Sergei Bondarchuk's Oscar-winning War and Peace, 1969) and Alexei Batalov (Gosha from the Oscar-winning Moscow Doesn't Believe in Tears, 1980). Having participated in the 1971 Cannes Film Festival, Alexander Alov and Vladimir Naumov's film depicts the radical rupture of moral and ethical values that occurred during the revolution, as well as the difficulties of the immigration and the lost role of the intelligentsia in the new Soviet era. This film by Oscar-winner Nikita Mikhalkov, which is based on the eponymous story by Ivan Bunin and his diaries Cursed Days, in which the author depicts the revolution as a catastrophe, divided Russian society. The plot takes place in the fall of 1920 when an unnamed captain from the remnants of the czarist army finds himself in a Bolshevik filtration camp, remembers his onetime love, his civilian life and asks himself "How did all this happen?" Through romantic images and direct references to Sergei Eisenstein's films Mikhalkov tries to reflect on the events that took place 100 years ago and that forever changed the country and its people. This is an unusual story of the consequences of the revolution filmed by Venetian Film Festival-winner Alexei Fedorchenko (First on the Moon, Silent Souls). It's about a group of revolutionaries who come to the taiga to "enlighten" the indigenous peoples in the name of art. Fedorchenko's screen heroes are based on 1920s avant-garde artists: Painters, architects, musicians, and others. The mosaic of facts blended with the director's imagination shows the confrontation between the foremost Soviet citizens and the smaller peoples of Siberia and the North who were detached from the revolutionary sentiment. Read more: Who is to blame for the 1917 Russian Revolution?